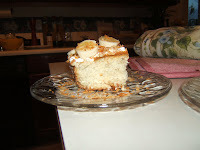 Fitting that I would name my blog after cupcakes and have my first recipe post a cake huh? Funny how those things work? Well Anyways, today is Cinco de Mayo and seeing as how I live in New Mexico, we've decided to have a Mexican Fiesta tonight. 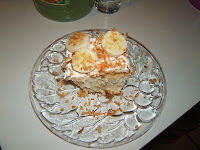 So, for dessert I made this Banana Coconut Tres Leches Cake from the Betty Crocker Website. For those of you who don't know Tres Leches is Spanish for 3 milks, meaning that there are three different types of milk that this cake is soaked in, which creates the moistest cake ever!! 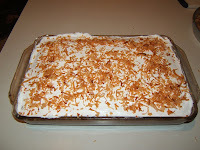 In this particular cake the milks were swetened condensed, coconut milk and whipping cream. Not only am I obsessed with baking, but I'm also obsessed with trying to make my treats just a little healthier. I am fitness and nutrition freak, but can't seem to give up the sweets, so I try to make little changes that will save a few calories here and there but not change the flavors of my desserts. So for this cake I used the lowfat sweetened condensed milk and the lowfat coconut milk. 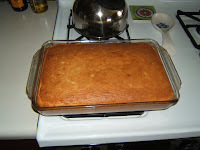 Also, in most of the baked goods I make I replace the oil with applesauce, which is what I did in this cake. (I'm not sure how much calories I'm actually saving, but it's kind of like a mind game, I don't feel as guilty. But at the same time, I'm always thinking "oh well since I shaved off a few calories I can have a bigger piece". So, either way, I win! !...At least that's what I tell myself. 1. Heat oven to 350°F (325°F for dark or nonstick pan). Grease bottom only of 13x9-inch pan with shortening or cooking spray. 2. 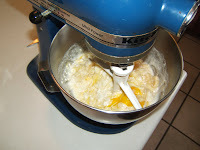 In large bowl, beat cake mix, water, oil, eggs and mashed bananas with electric mixer on low speed 30 seconds; beat on medium speed 2 minutes, scraping bowl occasionally. Pour into pan. 3. Bake 30 to 35 minutes or until toothpick inserted in center comes out clean. Cool completely, about 1 hour. 4. 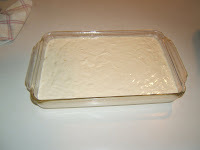 Poke top of cake every 1/2 inch with long-tined fork, wiping fork occasionally to reduce sticking. 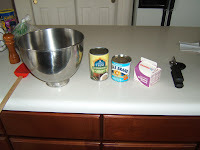 In large bowl, stir together condensed milk, coconut milk and whipping cream. Carefully pour evenly over top of cake. 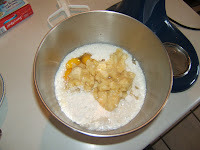 Cover; refrigerate at least 2 hours or overnight until mixture is absorbed into cake. 5. Spread frosting over cake. 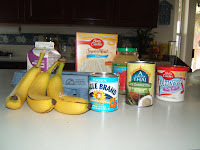 Garnish each serving with banana slices and/or toasted coconut, if desired. Store covered in refrigerator. Hmm, I have always wanted to adapt this to a cupcake. I think If I use double foil lining it might be doable, but it might still fall apart if you took the wrapper off. 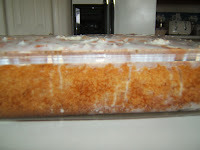 Can you tell me what you think, as I've never made tres leches cake before. Welcome to the wrold of blogging! Great first recipe! you combine a lot of my favorites!